Interactive cat toys encourages your cat to run and play, keeping them both healthy and active, and also helps to build a strong bond between you and your feline friend. Although there are many cat toys on the market, we will be discussing six popular interactive toys that our cats love. The remote control mouse, laser light, crazy circle, tease wand danglers, sisal toys and crinkle sounding toys. The remote control mouse is a popular interactive toy for cats. The furry plastic mouse, which looks very realistic, comes with wheels underneath that moves forward, backwards, left and right while being controlled with a battery-operated remote control. This toy is great for entertaining your cat, who loves to hunt, while you are a good distance away. If you haven't bought your cat this toy, you shouldn't definitely give it a try, our youngest starts to kneed when she sees me bring out this toy, they bought love it and play with it for hours. Our cats are big fans of the laser light, it gets them tuning, chasing, jumping and even hiding and stalking the red light likes it's their prey. The laser light comes in different models, there is the pen model that you hold in your hand and manually point the light around the room, and there are also some models featuring an automatic rotating lens and mirror that project the red laser around the room for your cat to chase, we have two of the pen model, one that produces just a simple light and the other produces shapes, they seem to love both equally. Crazy Circle interactive toys allow your cat to play with a ball that is contained within a circular tube shape. The ball usually remains in the tube, except for when your cat gets overly excited or mischievous, as ours do, and tries to get the ball out. You can start off with a small track and then buy more pieces later to extend the track and make it almost into a maze. This toy is one of our cats favorite toy, they play with it day and night, this toy is great for active kittens and cat's at all stage of their life. 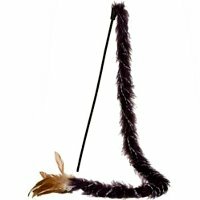 Teaser wand Danglers interactive cat toys are toys that come with a long wand and usually has either feathers or a dangling fury tail attached to it. These toys require you to dangling the tail or feathers around so that your cat can attempt to catch it. Cats are usually huge fans of this type of toy and can spend hours running and chasing, providing them a huge amount of exercise and enjoyment. Sisal roller are interactive cat toys that are great for both entertaining your cat meanwhile providing a place for them to scratching. Some have feathers on them while others have a mini scratching post at the bottom and a ball for your cat to play with at the top. These interactive cat toys are great because they are usually very durable and you get two items for the cost of one, a cat toy and a scratching post. A few brands offer sisal rollers that come in a variety of lengths and some can also be used as additions to your current cat condos or other pieces of cat furniture. There are even sisal scratching posts that comes with toys attached. Our cats are big fans of these simple but entertaining interactive cat toys. These toys come in many different shapes and sizes, however they all make that same crinkle sound whenever your cat touches, bites or pulls them around the house. These toys are also great for kittens since the crinkle noise isn't frightening or loud like some other toys. These toys last a long time, we still have a couple from when our cats were kittens and they still play with them, definitely worth the money. Cats love to play, your playful kitty will willingly run, jump and chase his/ her new toy. Playing helps to manage your cat's weight and is an important part of keeping your cat active and healthy. Visit our Cat Supplies page to find some fun affordable and durable interactive cat toys for your feline friends.